The word of the day around here is AUTOMATION! Around 2013 we began developing a new Mechanical Automation Systems Engineering course which was made live in June of 2014. In less than a year we're on our sixth course and the program is running very well. In late 2014 we added the complimentary class Introduction to Robotic Automation and this is on it's fourth course in six months. Then to round out this whole topic, we're currently in development of our third course on industrial automation and robotics to simply be titled Mechatronics which will hopefully be on the schedule by winter of this year. We've been teaching manufacturing courses for many years now, 3d design engineering courses for a decade, and computer technology courses prior to that. Wrapping the whole technology-based manufacturing ball of wax together seems to be something that we are uniquely suited for. The focus throughout all of these classes is real world application and real world parts and equipment. We do not play with legos or use training simulators. In Mechanical Automation Systems Engineering you learn the mechanics, parts, materials, vendors and costs involved with robotic manufacturing systems with some electronic control systems configuration. In Introduction to Robotic Automation you focus on electronic components, C coding language, and programming microcontrollers to acheive various goals, yet also with a small amount of mechanical control systems. Mechatronics brings both courses together; developing, programming, and fabricating automation systems for actual machine application. Your "test lab" is our machine shop. I can't believe it's been over a year since I've made any updates! We have been busier than ever with the new center. Classes are now held at The Washington Aerospace Training and Research Center. We've been running classes in the new facility non-stop since early summer. We are very happy to have had so much success, but things (like websites) have been neglected. The snowboards have been getting better and better. We keep adapting to build the best boards with the smoothest process. Those of you who may have taken the class in the past couple years would be happy to know that we've worked out a bit better edge bending method. I've also created a new CATIA snowboard design that utilizes what most call magnatraction, and reverse cambering as well. I'm currently building the first prototype. I am very happy to announce that we've created a school account with a snowboard printing business and can now offer printed topsheets as a part of the course! This assumes that the student knows how to use a graphic application that can create a quality graphic to scale. We did buy a few licenses of Adobe Illustrator that will be available to students in our CATIA classroom. From the beginning, we've been using fabric laid under a clear topsheet as our design. This has worked extremely well though. So for anyone thinking about a printed graphic, I would point you to our gallery and say that all those boards prior to 2011 have been fabric (with a few exceptions). For those of you that may still wish to have a clear board or use fabric, since summer of 2010 we've been getting our clear topsheet from a company out of Germany that is one of the only suppliers that can get us a clear high gloss plastic. So if you've been in the class before, take a look at the gallery and see what a difference the gloss makes. For a couple years now I've been proud to be a part of a student exchange program managed by the Future of Flight Museum in Everett and the Royal Air Force Museum in London. Each summer a small group of students from London (and this last year Australia as well) are toured across the country to visit all the top aerospace organizations in America. They came to me a while back looking for a composites program they could take while in the area. That program is my Applied Composites course. So this summer the Future of Flight people asked if I would like to build a snowboard for the museum and work with them to create a display that documents the materials and processes involved. Well, of course I'd love to do that. So at this time the graphic for the board has been accepted and will be sent off for printing shortly. Later in 2010 I took over the Composites Technician Certificate program and the future is looking pretty good. This is an aerospace focused composite manufacture and repair program that includes more academic study than our other courses which gives students a much broader understanding of the field. This is a perfect complimentary course to our Applied Composites program. It is a hybrid program where the study and quizzing is done online, and then students come into the facility on certain days to do labs. As we move forward in the development of this course I plan to add more and more hands-on labs and getting away from the student/teacher detachment of online training. 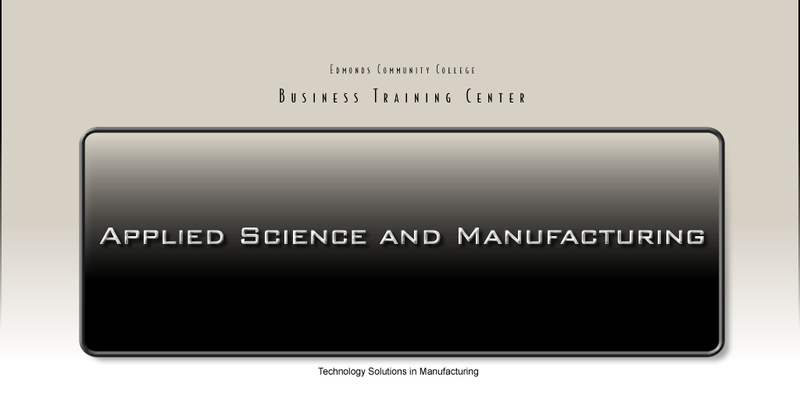 The Applied Technology and Manufacturing program is a program I began developing a couple years back. The idea was to integrate many of the methods used in fabrication; high and low tech. In the summer I received a grant to further develop the program and deliver it to a group of people looking for new skills. The class started the beginning of January and has been a great success. So much so that you can be sure we will offer this program in our regular curriculum. The class teaches four main disciplines; CATIA, Composites, CNC Milling and Welding. We teach each class separately in the beginning, but as the class progresses we begin to integrate the skills. As an example, we could use CATIA to design mold for a small box or cover, then cut the mold on the CNC, which can then be used as a form for a fiberglass or carbon fiber part. The class concludes with students designing and fabricating a larger scale project. In our current class we chose wind power as our goal. More great things have been showing up on our doorstep! We currently have several MIG welders and mini CNC mills, but we just received our full sized CNC knee mill from Grizzly as well as a new TIG welder. We also are now in possesion of two uPrint Rapid Prototype machines. If you have never seen or heard of these devices, I highly recommend you get to YouTube and check them out. These will become a standard part of all our CATIA and composites courses. CATIA to RP mold to finshed composites part. Beautiful. We will of course be developing curriculum focused on what's involved in using these machines. They can be fairly simple to use but more often require knowledge of a lot of software. This will also tie in perfectly with the 3D scanner that we've had for a few years now. So there's the update. Keep an eye on this page and the gallery for all the new developments. Most of our new equipment is just "out of the box" and I can't wait to see what we create with it as the year progresses. We're finally up and running again after a long summer of repairs. At this time we've just completed our first two composite classes since getting back. You'll find the pictures in the gallery section. We're creating new techniques all the time and the boards are looking better and better each class! Over the summer we did some big thinking and decided to develop a new facility dedicated to aerospace manufacturing training. We're currently in the process of renovating and hope to have it partially open by December. The building itself is located on Paine Field, right in the heart of all that is aerospace. With over 30,000 square feet of space, we hope to turn this into a training center beyond anything ever seen in this area. I hope you will all come by and see what we've done. A couple months back, Michelle Dunlop and Michael O'Leary from the Everett Herald came down and watched us build boards. They were around for a few classes, interviewing students and taking pictures. We never really knew when the article would come out, but yesterday there it was, full front page on the Sunday Herald! I want to thank Michelle and Michael for the nice writeup and exposure for our program. Fun stuff! I just added an online flash game called Cargo Bridge to the Gallery page. Try to build bridge structures that to help the little workers move their cargo. The next class in our Applied Composites/Manufacturing series is online. The first class starts in May. I plan on adding to this as needed. I foresee more classes using larger mills and CNC lathes. I've been changing classes around a bit. This will probably continue to happen as we add more and combine others. I decided to combine the RP and 3D scanning classes since it seemed more natural to have them together. I've also edited the CNC milling and RP classes so they no longer require CATIA as a prerequisite. After talking with others I could see that all the CATIA work can easily be demonstrated by the instructor and any models can be premade. This way any one can take the class and the focus stays strictly on the topic of choice. Added "Green" Info to the Student Resources links section. Great articles on how people and companies define what we see as green manufacturing. Special Projects section added. I think this might be a fun addition to the program. I'm looking to create a way to get real life experiences onto the site and involve students at the same time. If you look under Student Resources (bottom of the page) you'll find the new Special Projects section. As we come up with ideas using new methods or materials I will add it to the site. The main requirement for involvement is that the student will document the entire process in real-time, allowing myself to review progress. When complete, the document and all related data will be formatted and published to the site. PDF download will also be available. The snowboard project has been going very well. We're starting our fourth course this week. The local news has been out several times over the last month and the presentation at our national partner gathering last week was great. I think all the students have done a terrific job in all aspects of the class. everyone has worked well together in the shop environment, they're courteous, safety conscious and creative. You can check out their work in the gallery section when I get it online. I'd like to really thank everyone for all the help and support, especially the Material Science Lab at Monroe Hall for letting me use the space, all their equipment and making me feel welcome. Jason, thanks for always taking the time to help me and the classes with everything.